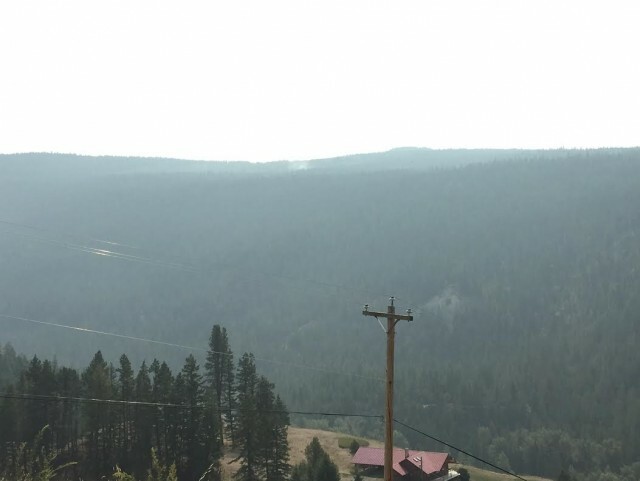 I just reported two plumes of smoke across the canyon from 8 Mile Ranch...almost directly across the canyon from Penny's and the Walker Hill break check...Forestry is aware of it. Stopped in at FireHall 51 and they too are aware of it and apparently there are crews on the way. I don't see anything, but that particular direction is partly obscured from our view, and the "valley smoke" doesn't help much, either. Wealth without work. Pleasure without conscience. Knowledge without character. Commerce without morality. Science without humanity. Politics without principle. Your bias suits you. Two new wildfires have ignited near 8 Mile Ranch, just south of the river near McCulloch Road. BC Wildfire Service crews have just arrived on scene and eight forest fire fighters are working on the two fires. Fire information officer Kayla Pepper says the two small fires are burning next to each other and resources are being shared between the fires. The smaller blaze is 10 metres by 10 metres and is currently burning at a Rank 1, while the second fire is 0.1 hectares in size and is showing some Rank 2 activity and open flame. The Castanet newsroom has received several reports of plumes of smoke in that area. When I was pulled over at the top of Penny's a BMID worker pulled in behind me and he said he was going to report it too. They were not very big yet(30 minutes ago)...one looks like it was about the size of a campfire plumb...the other quite a bit bigger...both along the same line of the hill side. Who in the hell would be out there and what would they be doing? Seriously? There is no reason for anyone to be doing anything out there right now that might potentially cause a fire. The news all around these days makes me realise how colossally stupid we've become as a species and I just want to bang my head on the desk. C'mon, at least wait until page 2 before we begin bickering about the cause. Woodenhead wrote: C'mon, at least wait until page 2 before we begin bickering about the cause. You are right Woodenhead...and I'm guilty of mentioning my first gut/verbal reaction to seeing those plumbs of smoke. Sorry....besides bickering won't stop the flames and fires from raging. I have to head back down that way here shortly, if I see anything more I will post it. Thanks for the info, BG. I'll post any info if I have any, as well. Right now I'm just glad it's on that side of the valley. Drove by about 20 mins ago. Way too much smoke to see properly. Will be back that way in an hour. Will let you all know what I see. BC Wildfire crews are making quick work of two fires in the Joe Rich area only half a kilometre apart. Fire information officer Kayla Pepper says the eight person crew is working to completely extinguish the two smaller Rank 1 fires. The smaller blaze is 10 metres by 10 metres, while the second fire is 0.1 hectares in size. They fires are near 8 Mile Ranch, just south of the river near McCulloch Road. Just drove past the view point area where the smoke up here was first seen. Still lots of smoke everywhere out there but it looks like there is low lying smoke over the trees in and around the first sighting area. No flames and no plumes. Thank you so much Forest Fire Fighting Folks...you sure jumped on this one fast!!! !